Five lucky students from the college — shortlisted from the 10 best artworks presented at Department of Communication’s art exhibition Jigsaw — will get their work featured in an art gallery in Bengaluru. The department conducted the exhibition of sketches, oil paintings, spray paintings, colouring and a workshop on July 27 and 28. It was organised with an aim to find “new masterpieces” from Josephites. “Ten of the best artworks from each category were selected by curators and displayed on the campus. 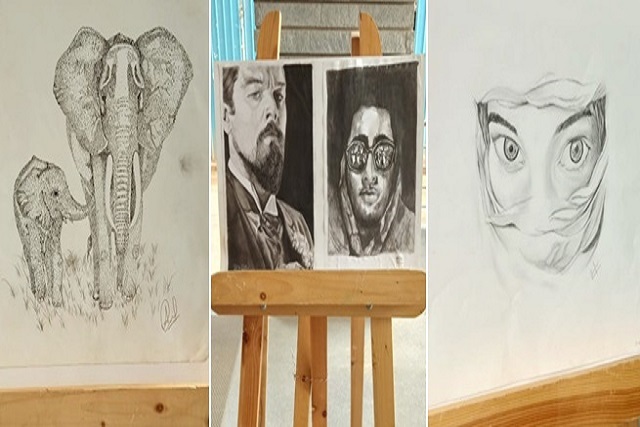 Five amongst the 10 best artworks will be featured in a future event at an art gallery in the city,” said organiser Harsha Jain, a student of III BVoc. Jigsaw also featured a workshop where students created bookmarks and PSA and sold them to raise funds for future events. An open-mic session was also held where students were allowed to come up to sing, perform stand-up comedy or play instruments. A stall for sketching and caricature was set up where students got their pictures clicked and student-artists made their sketches and gave it to them for money. Jigsaw helped the department raise almost Rs 6,000 over two days.